UTCC / Hyperfest 2018 - TrackHQ.com, the Web's leading forum for track day enthusiasts, racers and time attack drivers. We are taking Bullet, our converted Supermiata S1 (92 Miata). 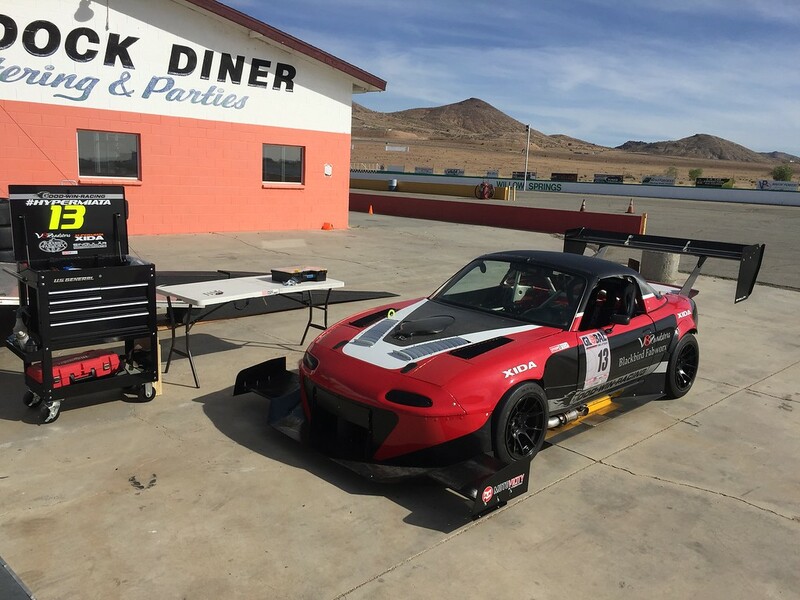 Ryan Passey of Goodwin Racing is taking his LFX powered (91 Miata) "Hypermiata". Bullet is roughly 2300 lbs with driverm=, making 400whp with a 6 spd Quaife sequential transmission. No hard data but we estimate it makes 1200~1500lbs of net downforce at 100mph. Hypermiata makes around 340whp, weighs closer to 2100lb w/ driver makes more downforce. Good luck, guys! Give 'em hell! That's just ridiculous in the best kind of way. Good Luck! Actually is goes fwhooosh, pow, fwhoooosh, pow, fwhooosh with a background "screeeeeeeeeeeeeeeeeee"
Straight cut gears in the sequential are freakishly loud, rising in pitch with road speed. Flat shift ignites unburnt E85 in the exhaust and shoots a nice fireball with each upshift.. POW! Then there's the wastegate chirping even though its recirculated, still chirps. No hard data but we estimate it makes 1200~1500lbs of net downforce at 100mph. How does one estimate net downforce? That seems like a massive amount! -Published CFD numbers for the foil in free stream (ideal conditions), corrected down to allow for turbulent wake off roof. -Surface area of splitter plus some known pressure differentials measured at the nose, again corrected down to be conservative. Could be a lot less or a lot more, but it's pretty safe to estimate over 1000 lbs at 100mph. Thus the term, "estimate". Can't wait to see how things shape up! I think both cars and drivers are going to surprise many of the east coasters. Sounds like a great show idea. Let me know if you sell it, I'd love to work on it. At those numbers it would make a great substitution for a Cessna 152 wing. That's an estimate of total net downforce for the whole car, front and rear aero. I imagine Ryan has some similar net lift estimates. Super excited. I've been wrenching and grinding away like a madman every day since I got word I was accepted. All the credit goes to 949Racing / Supermiata for making the logistics possible for us to go. The Hypermiata will be largely the same car I've been campaigning, 325whp and 2300lbs with driver. The major update is a new front end that Moti and I have been working on together, which should be a huge step forward in both downforce and less drag. New, even bigger dual element wing in the rear to suit. Funny to think I'll be the low power car of the pair. Bullet is going to be an animal, major sledge hammer approach, but Emilio and Sonny are the guys for the job to wrestle that thing to what I expect will be a great lap time. Hopefully we can both raise some eyebrows among people who never thought Miatas could play in the deep end. Last edited by thepass; 05-10-2018, 02:54 PM. It's been a lot of long hours to get the new front finished in time for UTCC (original deadline for next event was June). New GT1000 wing at the rear to balance. Tested Friday at WSIR with the 949 guys. Mega grip, doing 1:27's while just cruising and doing systems check on cycled RC1s. Three days to catch up on sleep. I'm not stoked about the weather forecast, there's definitely going to be rain at some point this weekend.